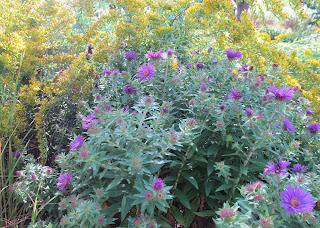 Welcome to Garden Bloggers' Bloom Day for September 2013. Here in my USDA Hardiness Zone 6a garden in central Indiana, the last few days have finally felt like fall, with crisp, cool mornings and nice breezes. Before that we experienced, within the last week, near record and record-high temperatures in the 90's (Fahrenheit). In the last 45 days or so, we have also received little to no rain, and this was after a summer that was doing so well, with moderate temperatures and rain when we needed it. But we must grow our gardens with whatever Mother Nature provides for us and this dry spell is nothing compared to last year's record-setting drought. In my garden, the goldenrod, Solidago shortti 'Solar Cascade' is in full bloom and the first blooms of Symphyotrichum novae-angliae 'Purple Dome' (formerly known by the much more easily remembered name, Aster) are just starting to reach their crescendo. Nearby another aster, Symphyotrichum novae-angliae 'Alma Poetschke', blooms. Across the way, in the garden border I refer to as Plopper's Field, where flowers are plopped in wherever there seems to be an open spot, another Aster, alsoo Symphyotrichum novae-angliae, is just starting to bloom. This aster is a passalong plant from my Aunt Marjorie, who died almost three years ago. She told me that she had once given some of these asters to my Dad, but he thought they were too messy for his garden so he didn't keep them. They are not too messy for me. I also call them by another well-known common name, Michaelmas Daisies, because they should be in full bloom around the Feast of St. Michael the Archangel, September 29th. Back across the garden, marking the entrance to the path I call Ridgewood Avenue (do you know why I call it that? ), another late blooming perennial, Hylotelephium telephium, which you probably know as Stonecrop or Tall Sedum or Sedum telephium, is blooming. 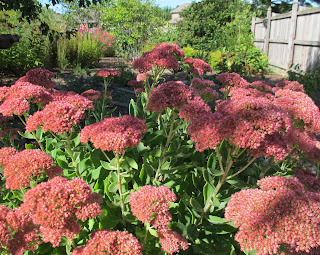 I have a couple more patches of Tall Sedum in a few other spots in the garden, too, because once you have a little of it, you have a lot of it. It is easy to dig up and divide. The rest of the garden is dotted with the floral flotsam of summer, blooms that have been hanging around, through the dry spell, providing bits of color here and there. 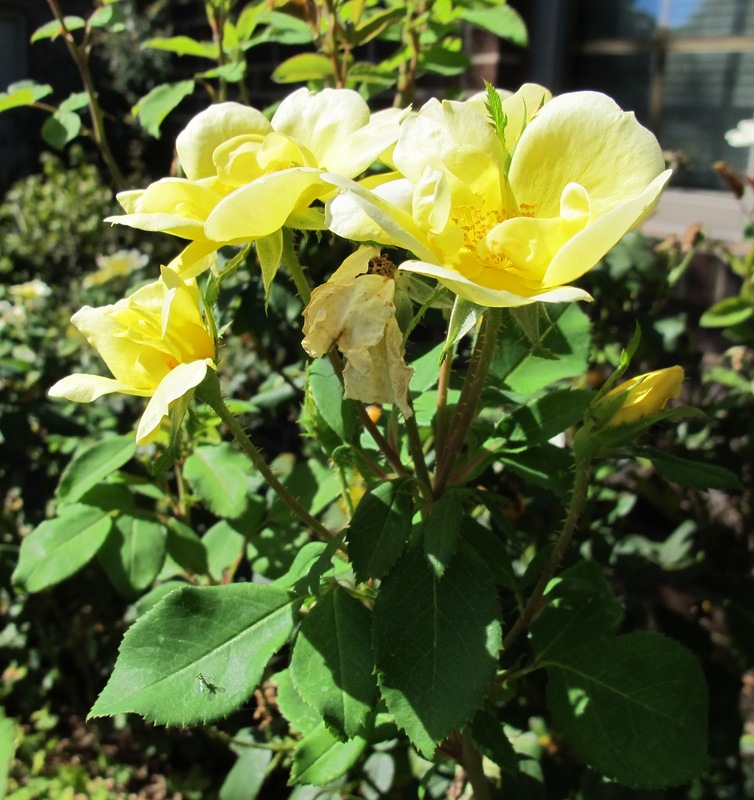 One such piece of floral flotsam is the ever-blooming Sunny Knock Out® Rose (Rosa 'Radsunny'). Another bloom that has lingered from August is Lo & Behold® 'Blue Chip' Buddleia. 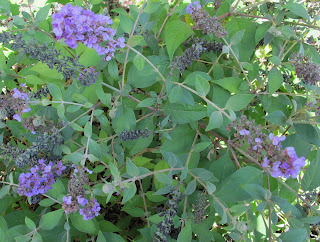 I have six of these low growing butterfly bushes planted on both sides of my front walkway. They are covered with butterflies and bees. When I walk up the front walkway, those pollinators all scatter, probably scolding me as they go. But if I stop and stand there for just a few seconds, they all come flying back and I am surrounded by them. I am tempted to get a cushion and just plop myself down on the front walk to see the show of pollinators. It would be better than anything on TV. But before I do such a thing, I have just one question to ask. What's blooming in your gardening on this mid-September day? I would love to have you tell me about your blooms and invite you to join in for Garden Bloggers’ Bloom Day to do so. Wow! Your Hylotelephium telephium took my breath away!!! Thanks for hosting! This is my favourite meme too, it gives me a great record of how my garden is developing, thanks for hosting again and happy GBBD! Carol-it has gotten cooler here as well...feeling a lot like fall. Your gardens are looking wonderful with still many blooms and I especially love your roses and dwarf butterfly bushes-so lovely. Thank you for hosting and Happy GBBD! Just the faintest hint of Autumn here. All of a sudden I realize the daylight hours are shorter. Your garden looks good despite some late heat. We also had a mostly mild summer, with a blast of heat to finish off. Happy Bloom Day! Your Knockouts are so yellow! Mine wash out quickly...I have been lazy lately..just post fall burnout..I suppose... Happy GBBd! I just love the Goldenrod and Aster combination. It's quite lovely. 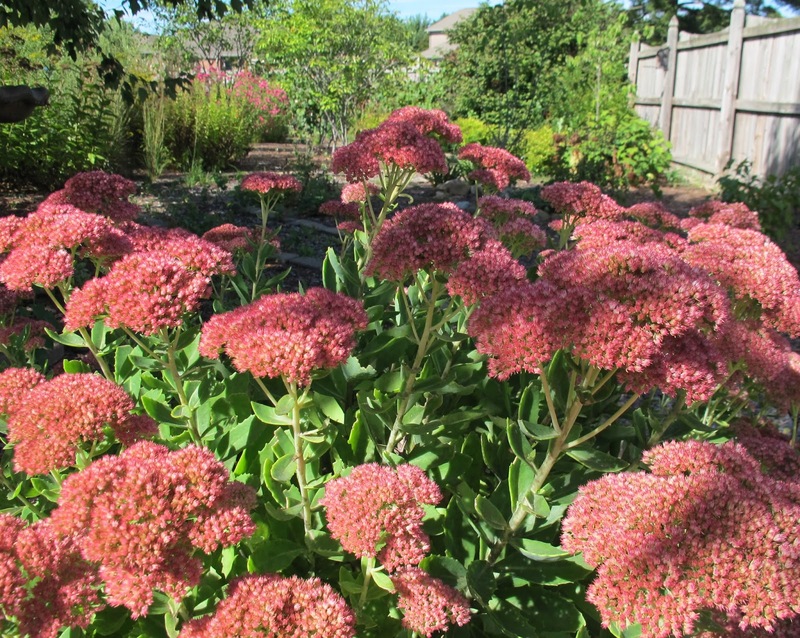 The tall Sedum looks terrific too. We're in the middle of our usual long dry season. It lasts for many months every year, and is always a trying time of the year for any gardener. i love the sound of your Buddleia and at that height, easier to deadhead! We're about to have our first storm of autumn here in the UK today, so Blooms Day is set to be a bit of a gardening and floral challenge on this side of the pond! Thanks for hosting again and happy GBBD! I'm still waiting for my golden rod to flower, yours is looking so good. I don't think I will ever get used to the aster's name change, they will always be asters to me! Your dwarf buddleja sound ideal for the front of the border, must look into that. Thanks for hosting once more. Thanks for once again hosting GBBD! Yes, this droughty weather has played havoc with my fall bloomers. Love your collection of asters. Happy GBBD. I love the contrast of the purple asters with the golden rod behind. I love the yellow rose at this time of year! Very nice. It sounds like you and I have shared the same weatherman this summer. Things were going so well until mid August when the rain stopped. I have been watering like crazy this week. Happy GBBD to you Carol. I hope you will send some of those cool crisper mornings down our way. My plants would appreciate it It is nice to see what I think of as typical fall plants growing. Where is our golden rod this year? I don't have any n my garden but there it is usual to be seen out side and not a sprig this year. It is too dry for anything to grow where it is not watered by the gardener. Happy Bloom day and thanls for hosting. Floral Flotsam -- my favorite part. We await fall here. Thanks for being a gracious hostess this Bloom Day. Love that neon lavender of the aster in front of the goldenrod! Beautiful blooms for having no rain. Glad to hear you've got some cool-crisp mornings (can't wait till those come down our way). I love the asters and their even more special when they come from a loved one! Thanks so much for hosting! My garden is beautiful right now because southeastern Pennsylvania was relatively cool and moist all summer. Hope you enjoy the photos. I love seeing that bushy sedum. been wanting to do that to my garden. hopefully it will come. Happy Bloom Day! Won't be long until our gardens are full of Autumn colour! Mid October is usually the first frost for us. I love "floral flotsam" what a term! I passed through Indiana (I live in upstate NY) in late August on the way to Arkansas and again, on the way back, the first week of September- it certainly was hot and dry, wasn't it? I hope you get some needed rain soon. Alana at Ramblin with AM. Thanks for hosting again. Happy GBBD! We too have had to supplement Nature's watering cycle. Before I realized the abundant water from this summer had dried up we lost a few long term participants in our garden. It's easy to get lulled into watering complacency when you get an almost English summer. But there is still a lot to be grateful for in the garden this morning. Happy Bloom Day! We've had a similar weather cycle but it's raining today which should perk up the flowers that are blooming. Your garden is looking beautiful especially that yellow rose. Your blooms are beautiful, and I think I need to add one of those low butterfly bushes to my garden! You have a better attitude about the hot, dry weather than I do this year. I think I'm just so very tired of it. Thanks for hosting! Because of their self-seeding tendencies, I didn't put any asters in my now 7-year-old garden. 'Alma Poetschke' could get me to reconsider! My garden has lots of ongoing flowers from August this month. I welcome them all!. Hi Carol- I have the same Symphyotrichum in my garden! And I must applaud you for consistently using the new genus in which the aster has found itself. I'm still using aster for awhile at least. Anyway, thanks for sharing your beautiful garden with us all. I wasn't aware of any name changes. They do that all too often don't they? Lovely blooms, no asters in flower in my garden yet. Thanks for hosting this monthly floral extravaganza! Love it. Things are looking pretty in your gardens as always. September and summer still looks to be going strong in your garden Carol! Asters and Goldenrod are blooming in my garden right now. What a beautiful combination of aster and golden rod! Just love it! You have some great asters. Beautiful colors on those September bloomers, Carol. In Central Texas, we're eager for fall and hoping coastal Mexico's storms send us some much-needed rain. Thanks for hosting! 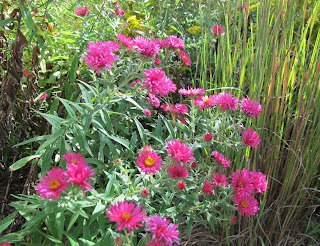 I love the pink Aster, whatever the pundits want to call it. Thanks for hosing this monthly event! Your asters look great, especially with the goldenrod, which I am adding to my garden this year. I'm featuring Anemones, among other fall bloomers. I LOVE all the late summer color. Considering the weather, the color, and all the new beginnings, fall seems like the best season - at least until it's spring! Happy GGBD! I love your blooms. Lovely asters Carol. Guess we've all experienced weird weather this year (what else is new, eh?). It's been exceedingly dry here in that last two months. But we have a teeny, tiny cold front right now. It's only 91F! there is lots of colour in my tropical garden at the moment - it really brings a smile to my face! I enjoy seeing what you have blooming in Ploppers Field each month. I don't think the Michaelmas daisies are too messy, either. Hi Carol: It sounds like our weather has been similar. I can't believe it was in the mid-90s on Tuesday, and a high of just 60 today! I love the idea of your Ploppers Field. Thanks, again, for hosting! 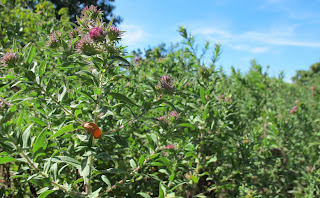 Love those 'Lo and Behold' butterfly bushes! Mine didn't survive last year and I'm not sure why, but I think they're worth trying again. Hope you're getting some of the rain we're getting tonight, too! Lovely as always. It seems we have been experiencing the very same weather up here in Western MI as you have there. Any hint of color in the foliage yet? Happy Bloom Day! We're cooling off a bit too, tho temps are still up and down. Hot today. Love the deep colors of your asters (or whatever they're called now). I love your flower combinations! The colors compliment each other very well. Thank you for the tour of your gardens. I added they link to my blog to let you know that the coleus is blooming and so are the invasive swallow-worts. Been away, but I see you are still producing a great site, Thank you. I like your description of "floral flotsam." I feel like that's most of what I've got right now, the notable exception being the one corner I posted a picture of. 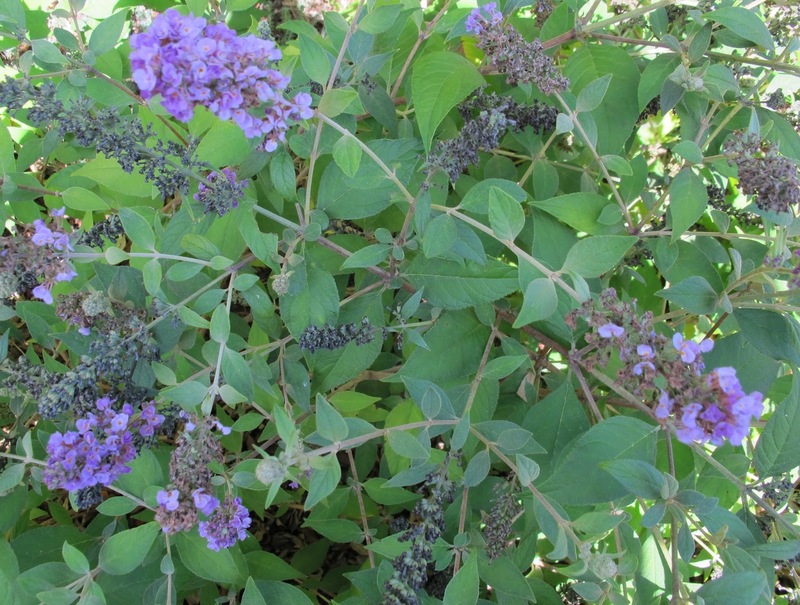 I, too, really like the 'Blue Chip' Butterfly Bushes. Mine have been blooming all through the long hot summer. But I can hardly wait for the mild days of fall! Lovely to see your autumn blooms, they are a great contrast to my spring garden which is full of pastels and pink! Thanks for hosting. Carol, I love asters so this time of year is exciting as they start to bloom. Your fall garden looks great! Your Solidago is looking lovely, I haven't seen one of those before. Looking forward to visiting other gardeners that have taken part this month. "Floral flotsam" - what an excellent phrase. It's getting cooler here in the UK, too, but I haven't yet lost the begonias. Aster 'Purple Dome' is a real winner for me too. Blooms right through the first couple of frosts. Thanks for hosting once again, Carol! Those Asters have such marvelous color. I wish we could grow Buddleias in Oregon. 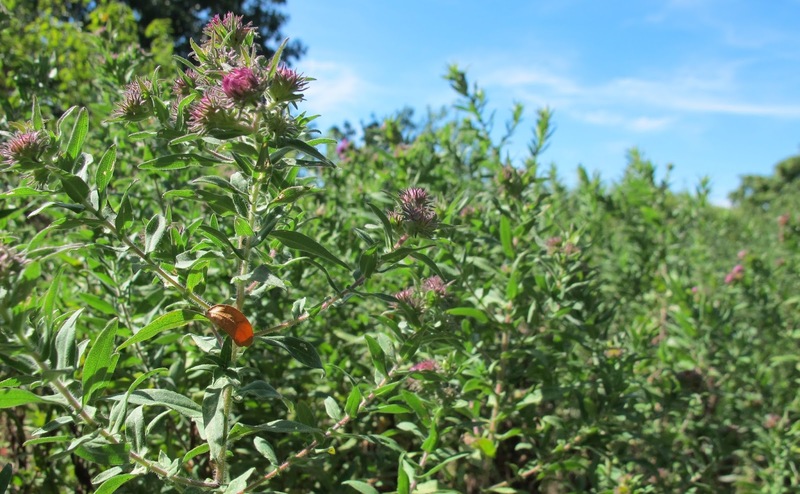 Bees and butterflies love them here too, but unfortunately they are invasive thugs here. I enjoy them vicariously through your blog! Thanks for hosting, and happy GBBD! Kind of ridiculously late this month cuz I had to travel on Bloom Day, but I'd spent the morning shooting flowers in my garden, and they wanted a post. Has been feeling like fall for several weeks, and I fear an early frost is likely... I'll be sad if it happens, but even if they don't produce useable food I'm enjoying the flowers now. You have so many lovely flowers! Thank you for hosting Garden Bloggers Bloom Day. Beautiful blooms are wonderful to share! 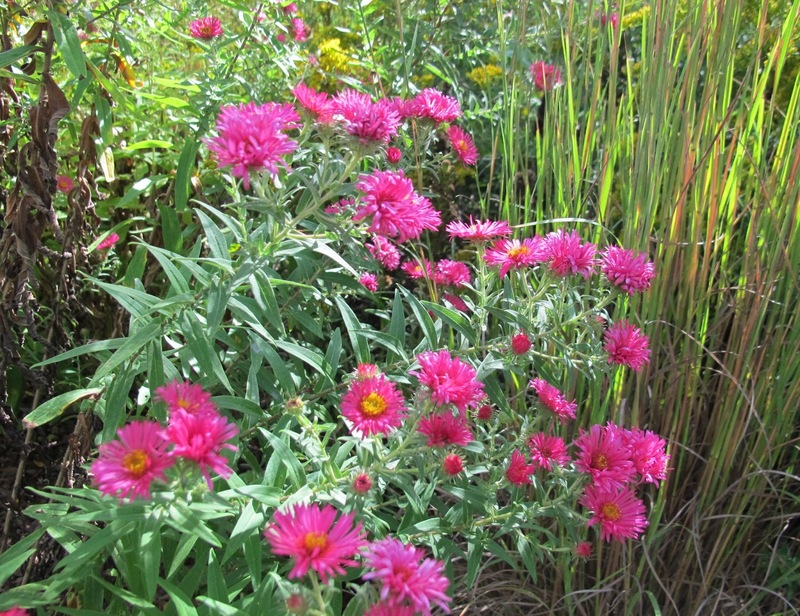 Thanks for sharing Michaelmas, love St. Michael and never knew Asters by that name! Getting on the bandwagon a little late. Your garden is looking lovely as always.